GameStop Exclusive TEKKEN Gift Package Details | SDTEKKEN.COM - TEKKEN News Resource! Just a reminder to anyone on the fence about preordering TEKKEN 6! The TEKKEN Gift Package is exclusive to GameStop stores and GameStop.com ! You can secure your preorder goodies by putting $25 down in store or reserving it online. For more details and pics of the goodies, click below! 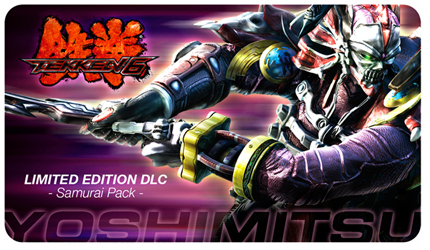 The downloadable content pack includes an official Cardboard Tube Samurai outfit designed by Penny Arcade exclusively for Yoshimitsu. Turn the legendary samurai into the dual-cardboard-tube-wielding warrior as featured in Tekken 6! The pack also includes limited edition Samurai Battle Banners with which you may customize each of the 40 fighters in Tekken 6. Transform your favorite characters with the Samurai Pack show and show-off your supremacy online! 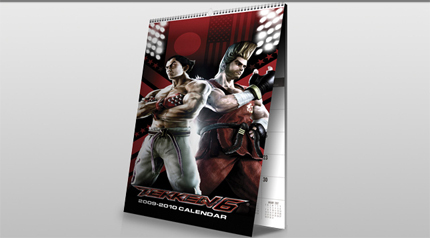 The collectable calendar features the hottest characters of Tekken with incredible graphic detail! Note: This gift pack is currently available to North American residents only. This entry was posted on Tuesday, June 23rd, 2009 at 10:27 PM and is filed under GameStop, Namco Bandai Games Inc., PlayStation 3, Preorder, TEKKEN 6, TEKKEN 6 Limited Edition Wireless Fight Stick Bundle, USA, Xbox 360. You can follow any responses to this entry through the RSS 2.0 feed. You can leave a response, or trackback from your own site. How do you reserve it online? Oh I totally forgot about the fact that there will probably be tons of downloadable content for T6. Hopefully we will see new customizations, new costumes, new stages, and maybe even *gasp* new characters! yeah i really hope they will do tons of customizations i will buy everythink (expect womens i dont play them ^^) but i dont think they will make new characters or stages(maybie) this will be for the next tekken. I reserved it already but didn’t get any of the bonus content yet like the calendar. I assume I will get it release day? The gift package will be available when you pick up your copy of the game. when will be the limited tekken 6 card released? will it be on the philippines too? will it be on the philippines? when is the release date for the tekken 6 limited edition card? on the Calendar i just called a coupe of Gamestops in TX and they dont have it, they said they wont have it until T6 comes out…which is kinda of..well….retarded ! i got a question the Limited Edition Tekken 6 Samurai Pack Downloadable has only 1 custom for yochimitsu and flags i mean is ther another custom for the others players in the samurai pack ? Will they come with a USB cable, or at least we can plug it in to the USB? Wireless connections should be disabled in a big event such as Evo, if that is possible. Is this package available for the PS3?